Comtrend Launches Innovative End-to-End Surveillance Solutions with Local and Cloud Storage Options. Comtrend, an industry leader in networking solutions, announced today its new end-to-end surveillance solutions. These surveillance solutions will include the hardware, software, and support needed for Service Providers to easily and successfully deploy surveillance systems for their customers. Comtrend’s surveillance solutions will offer both local and cloud storage options. With the use of cloud storage, Service Providers can offer multiple new services such as active system status monitoring and concierge services. Service Providers will be able to actively monitor the health of their customers’ surveillance systems with features such as motion sensor alerts, camera connect/disconnect alerts, and recording start/stop alerts. Service Providers can also offer concierge services for various situations. For example, if an end customer requests to have a clip of a particular date/time that they believe an event occurred in their home, Service Providers can easily look up that event and provide the customer with the requested video clip. In addition, cloud storage offers infinite scalability opportunities. Comtrend’s all-in-one surveillance solutions offer an easy setup and installation for business and residential applications. With video going to the cloud, there is no port forwarding configuration, static IP address, or DDNS needed. 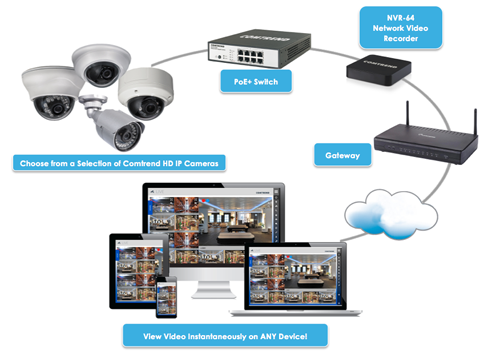 These end-to-end solutions consist of a product lineup of PoE switches, IP cameras, network video recorders (NVR), as well as the software/app for remote-device viewing capability (mobile phone, tablet, laptop, etc.). With a unique per camera video storage retention feature, users can assign individual cameras specific storage durations to optimize their storage. For example, if a user would like their front door IP Camera to store more video than an IP Camera indoors, it is as simple as a click of a button. Comtrend’s surveillance solutions also feature video assurance. If the NVR is vandalized or destroyed, the ability to review the video is unaffected because the video is stored online. Comtrend’s surveillance solutions utilize Microsoft Azure for unparalleled data security. In combination with Smartvue’s S12 solution, Comtrend’s surveillance solutions are a low-risk, high reward opportunity for Service Providers. This year, Comtrend celebrates its 25th anniversary in the high-tech industry. Since 1990, Comtrend has become one of the leading global providers of advanced networking solutions. Comtrend designs, manufactures, and markets a wide range of networking equipment consisting of bonded A/VDSL2 gateways, home and office networking technologies, and surveillance and SMB wireless solutions. Comtrend is committed to industry standards, interoperability and market-leading performance. The company has its North American headquarters in Irvine, California.